Aljazeera notes that some US media outlets did not bother to cover these attacks in Iraq, and wonders if the story will return. I think the answer depends on the journalistic integrity of the outlet. For many, the answer will be no. Many US media are nationalist media, and cover stories having to do with US national projects. Americans have already decided that Iraq was a mistake, and they know the US military is leaving, and so what happens there is not "news" as much of the corporate media defines it (i.e. a story that generates profits because of wide public interest in it). This may strike some readers as too charitable, but I think it captures one dimension of the problem of the US media. If you really want to know what is going on in the world, you've got to sample other sources. 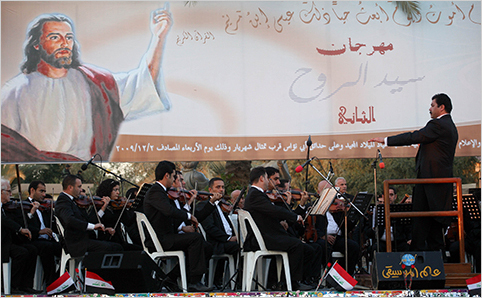 The New York Times covers a celebration of something-or-other in Baghdad. Image: Read all about it. Amira Edan, the director of Iraq’s National Museum, says that soon she will no longer have to worry so much that the famous institution remains closed to the public for fear of violence. People will just be able to Google it. “It’s really wonderful,” she said Tuesday. Eric Schmidt, the chief executive of Google, had just made a presentation inside the museum, announcing that his company would create a virtual copy of the museum’s collections at its own expense, and make images of four millenniums of archaeological treasures available online, free, by early next year. The museum, badly looted during the American invasion, has been declared reopened three times: in 2003, by the American occupation authorities, again in 2007 by Iraqi officials and most recently in February by Prime Minister Nuri Kamal al-Maliki. None of those openings, however, involved letting the public back in. A few invited scholars, journalists and the occasional school group have been allowed to visit. Only 8 of the museum’s 26 galleries have been restored; most of the collection’s treasures are in secret storage. Jared Cohen, the State Department official who organized the visit, disputed a suggestion that the event seemed like a government-sponsored infomercial for Google. “This is a really good example of what we’re calling 21st-century statecraft,” he said. A dozen other companies are involved in the project to digitize the National Museum’s collections, so “it’s not an exclusive club,” he added. But if you can't wait, try this: The Virtual Museum of Iraq. Image: One of Iraq's treasures: The royal helmet found at Ur, dating from Sumerian times. 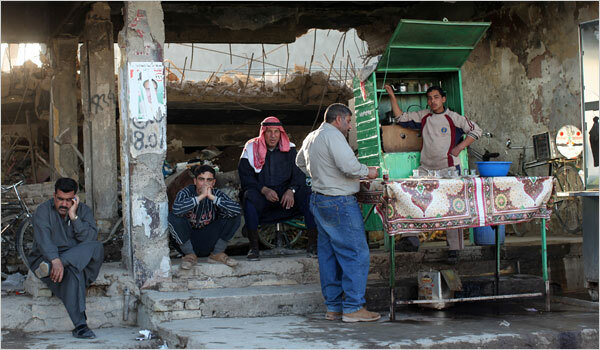 From the McClatchy-affiliated blog written by Iraqi journalists, Inside Iraq. There are other solutions than bothering the people. Yesterday was one of my worst days. I left the office around 5:10 pm and arrived home around 8. I had to spend two of three hours on a bridge waiting for the security forces to allow me and hundreds of other people in their cars to pass the checkpoint. There was no real security procedures or heavy searching for car bombs or any real danger. The whole issue was the departure of the Turkish officials' delegation who came early Thursday. With the news from my wife about the bad and serious fever of my son Haider and the smoke coming from the exhaust of the truck beside our car, waiting for opening the road became so long. time was passing so slowly. The wait in our car was a real psychological torturing. Around 7:30 we passed the checkpoint. During most than two hours, Most of us left thecars and gathered on the top of the bridge watching the empty street and waiting for the official convoys to pass. We did not really care about them and all we were thinking about was the end of our unjustified suffering. People started telling jokes and funny comments about the guests and their departure. A man suggested that government should think seriously about buying helicopters to use for the guests of the Iraqi government. He believes that helicopters would save time, money and provide the best security because no one in Iraq has one. The suggestion was widely accepted by some of the drivers. A second man said that the government should receive the official guests at night when Iraqi are busy with the electricity problems and the talk about their usual bad days (we do not really talk about nice things because we lost them all in Iraq). This suggestion was rejected by many while others started laughing at the man and telling him that the guests would not be able to see how safe Iraqi is. Another young man suggested that the government should specify some roads for the governmental use only. the long discussions were interrupted by the move of the first cars in the long lines sending an alarm for everyone to turn on the engine of his car. As for me, I really support the first suggestion about buying helicopters because at least, I would not have to wait for any other extra hours for the sake of people that I don't even care about. 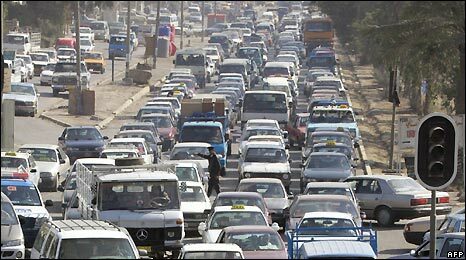 Image: Baghdad traffic jam, 2008. There are plenty of TV shows about people doing incredibly dangerous things in exotic locales, but give a thought to Luca Marchio, an Italian "tourist" who went to Iraq, and visited Irbil, Falluja, and Baghdad just like they were normal destinations. So far, so good. See the New York Times article. Image: tourist shopping in Falluja. 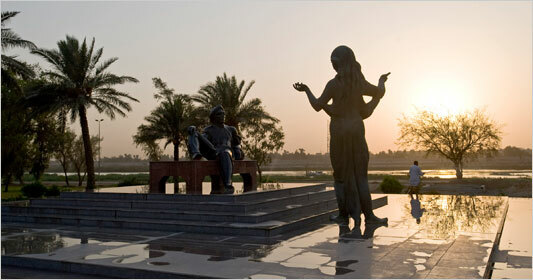 Also, below, the statue of Scheherazade in Baghdad from another New York Times article.